Justin Shearer was born in 1980, in Louisville, Kentucky, USA. He is a reality television personality and street racer, probably best known for his appearance in the Discovery reality television series called “Street Outlaws”. Aside from that, Big Chief is well known especially in the Oklahoma City street racing scene featured on the show, from where he gets his nickname. His various exploits have helped raise his net worth to where it is now. How rich is Big Chief? As of early-2016, sources estimate that his net worth is at $800,000, mostly accumulated through a successful career in racing and in television. Being a racer, Chief owns several cars, but the one he’s featured in the most is a customized Pontiac Lemans he calls “The Crow”. As the television show continues his wealth will also steadily rise. Since Big Chief was young he has been interested in cars and racing, including horses – he was either training horses with his mother or working on cars with his father. At nine years old, he was riding his bike to go to the city street racing scene and watch the races. Soon he moved to Oklahoma, and became involved with the racing scene there. His passion led to him being the eventual owner and manager of the races; if anyone wants to race on Oklahoma Streets, Big Chief is the one to approach. Even before he was part of the street racing scene, he was already saving money to build his dream car, which would eventually become “The Crow” – a 1972 Pontiac Lemans. He has customized nearly everything about the car, putting in a Machine Balanced Pontiac Big Block motor, custom built Twin Turbo Pistons, Advanced Racepak Wiring, and 12.5” tires. The car itself is said to run on 1500 horsepower. 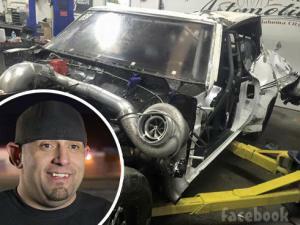 After the car was constructed, Discovery channel approached him and offered him the chance to become part of the reality television show called “Street Outlaws”. Chief accepted, and the show has since raised his net worth significantly. The Discovery Channel show focuses on revealing, and putting a spotlight on the street racers, and races from both Oklahoma City and New Orleans. It features the managers such as Big Chief as well as other personalities. Of course, racers have had their own notoriety being that street racing can be a dangerous endeavor. There have been reports of accidents and other people being involved in car crashes and the like. Also, in order to keep things legal for the show, they all race in a closed environment, so avoiding any problems with the law. For his personal life, it is known that Chief is married to Allicia and they have two children. When he isn’t working on cars, he spends a lot of his time in the gym working out and he loves his energy drinks, especially Monster. He says he idolizes Dwayne “The Rock” Johnson, and listens to a variety of genres of music. Aside from that, his favorite movie is “Two Lane Blacktop” One of his biggest fears is just being average, so he works continuously on improving himself. 1 Pitcher with the Philadelphia Athletics (1903-1914), Baltimore Terrapins (1915, Federal League), Philadelphia Phillies (1916-1917), and Chicago White Sox (1925, 1 game). 2 Made major league debut on 20 April 1903. 3 Inducted into the Baseball Hall of Fame in 1953. His Hall of Fame plaque does not list his season in the Federal League. Yes it is well deserved because I love this show! Look forwards to every Monday that it is on!